It has already been a month since my last blog post. Short but sweet, this period has given me time to progress with my artists’ book Surveillance, a tunnel book structure. I’m absolutely thrilled with the results and look forward to meeting with Natalie Freed in Austin in April for integrating the electronics part of the book. It did require some patience and time to get back into detail work for this publication and applying glue again! The month gave me pause for reflection and the time spent on the creation of new publications was fantastic. You know who you are when you are creating what you love. © 2019 Louise Levergneux. Prints of the cover for Surveillance. © 2019 Louise Levergneux. Prints of the pages for Surveillance. © 2019 Louise Levergneux. Remembering registration on an Epson R3000. © 2019 Louise Levergneux. Back page for Surveillance. © 2019 Louise Levergneux. Cutting details for the cover for Surveillance. © 2019 Louise Levergneux. Measuring for the accordion side for Surveillance. Last January, in Florida, I meticulously planned a few studio and contact visits. When a problem with our travel trailer arose, another disappointment interrupted art. As plans changed, I could no longer meet with John Cutrone, at the Jaffe Center and a studio visit with Dorothy Krause had to be cancelled. I also proposed to meet Merike van Zanten during her residency at The Arthur & Mata Jaffe Center for Book Arts. With Le Château’s problem, this stopover was also annulled. Back in September 2017, I wrote a post entitled Pennsylvania. This post featured artists’ books with the theme of war after touring Gettysburg. One of the artists’ book featured in this post was A Soldier of the Second World War by Merike van Zanten. So, knowing I would be in Florida, I arranged a get together. 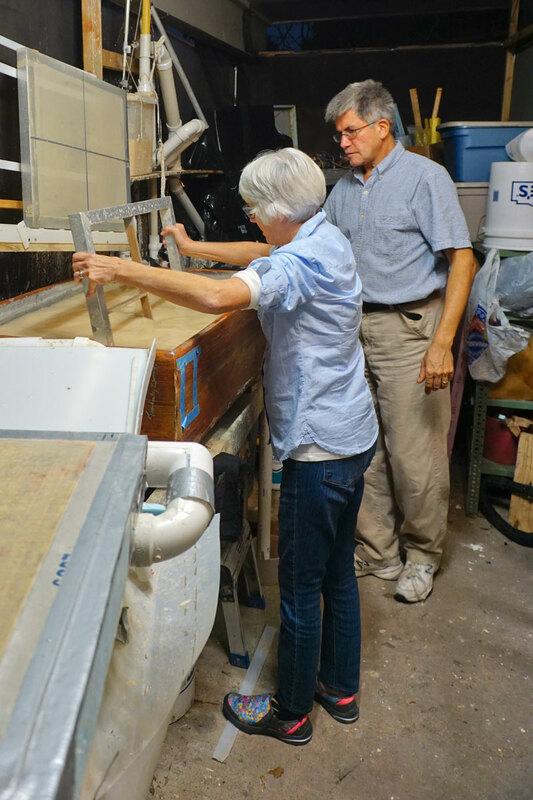 Unable to view Merike’s creative work in person, I thought you might join me and look at what Merike is accomplishing during her time at the JCBA’s as part of the Helen M. Salzberg Artist in Residence for the 2018/2019 academic year. © 2019 Merike van Zanten. John1, eco print on paper. © 2019 Merike van Zanten. Hibiscus and fern print on paper from Merike’s residency. Merike, a book artist, comes to the residency from the Netherlands, where she founded Double Dutch Design. Her artists' books focus on nature among other things and she incorporates found materials, utilizing a variety of techniques. Some of her books are quite sculptural. Merike’s proposed Salzberg Residency creative project begins with substantive research and experiments in eco printing, a technique of extracting color and images from plants and metals through steam, without the use of inks. She uses paper, fabric, and leather as substrates, and these experiments will be bound into an artists’ book unified by technique. © 2019 Merike van Zanten. John8, eco print eucalyptus on silk. During the residency Merike also conducted a series of workshops on eco printing at The Jaffe Center, as well as at outside venues. Merike van Zanten is getting lots of publicity for her residency. Here is a link to an article by Judith Klau, Reflections from the Jaffe Center: Wednesdays with Arthur #7 who explains Merike’s work in progress. © 2019 Helen Edmunds. Merike at work at the Jaffe Center during her residency. The South of Florida is one stop I wish I had not missed, but as Carre Otis said “Life inevitably throws us curve balls, unexpected circumstances that remind us to expect the unexpected”. Talk to you in May! I was very engaged in Florida, exploring studios and visiting libraries to present my artists’ books to Special Collections. My séjour facilitated contacting a few librarians and even had the opportunity to re-connect with an artists’ book that was previously acquired. I reached out to the Florida Atlantic University, the Flagler College, Florida International University, Florida State University, Miami University, Ringling College of Art and Design, University of Central Florida, University of South Florida, and the Southern Florida University. © 2019 Louise Levergneux. The Alfred R Goldstein Library at Ringling College of Art and Design. © 2019 Louise Levergneux. The Alfred R Goldstein Library lobby. © 2019 Louise Levergneux. Brizdle-choenberg Special Collections Center at the Alfred R Goldstein Library. Showcasing my published books to the Brizdle-choenberg Special Collections Center was a distinct pleasure. 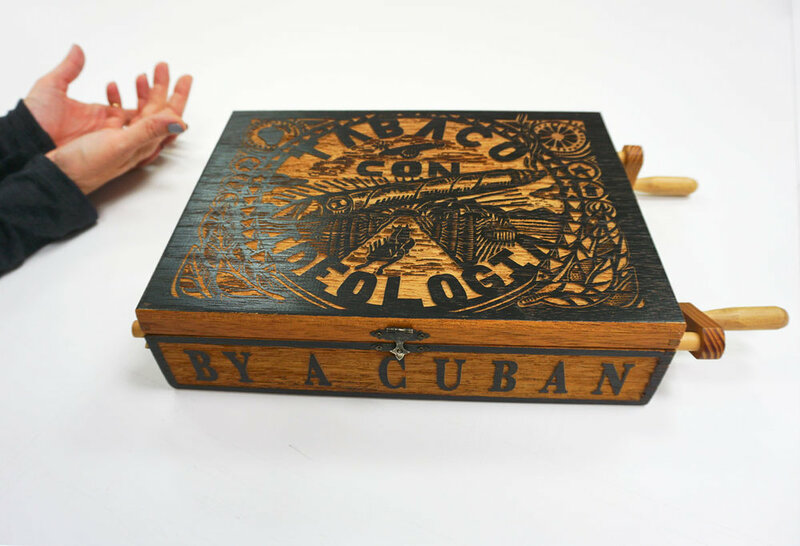 Special Collections specializes in artists’ publication projects, prints, and rare books at Ringling College of Art and Design. Janelle Rebel invited the special collections assistant Ali Vargas-Fournier and the director of library services Kristina Keough to join us in the discovering of specific bindings and subject matter. It was undoubtedly a successful meeting with the acquisition of Decades Apart, 26NOV2006, Xtraction and four flip books from the Outside of the Studio Series to the Alfred R Goldstein Library. The library selected books that would be appreciated in a research consultation by art, photography, animation, and film students and art and design practitioners. © 2008 Louise Levergneux. 26NOV2006, last copy acquired by the Special Collections of the Alfred R Goldstein Library. © 2019 Louise Levergneux. Decades Apart, copy 4, last copy acquired by the Special Collections of the Alfred R Goldstein Library. © 2012 Louise Levergneux. Air.2 from the series Outside the Studio acquired by the Special Collections of the Alfred R Goldstein Library, Earth.11, H2O.3, and FIRE.3 were also purchused. © 2019 Louise Levergneux. 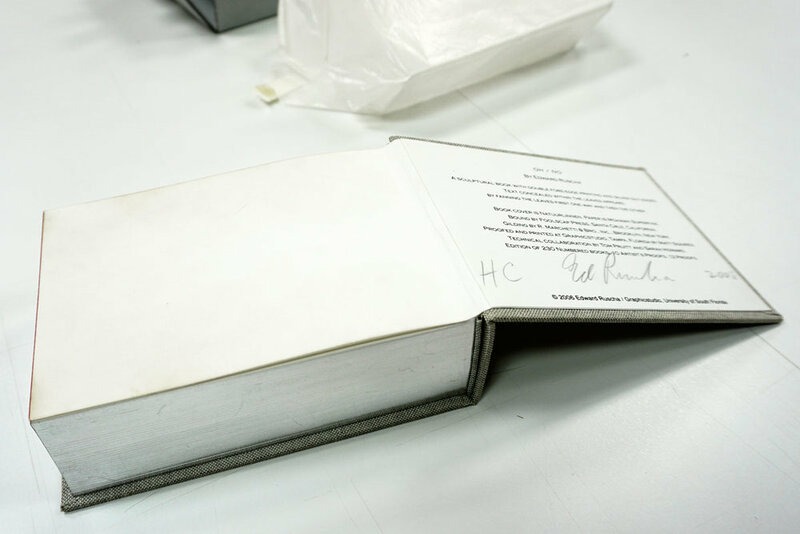 Xtraction, copy 1, last copy acquired by the Special Collections of the Alfred R Goldstein Library. © 2019 Louise Levergneux. Desert Swatches was acquired in 2014 by the Special Collections of the Alfred R Goldstein Library. © 2019 Louise Levergneux. Desert Swatches with its catalogue information. © 2012 Louise Levergneux. Desert Swatches. The Alfred R. Goldstein Library a state-of-the-art building that seeks to transform the way that users engage with library collections and services, opened in January 2017. Architecturally stunning, and an active physical and digital destination on the Ringling College campus. © 2019 Louise Levergneux. The Alfred R Goldstein Library lobby showcasing Julie Miller Kanapaux artwork, Momentum 2016. One can find, broadsides, democratic multiples, documentation of time-based and performance projects, engravings, exhibition publications, experimental writing, fine press books, flip books, handmade editions, historic facsimiles, parlor toys, photo-bookworks, prints, rare books, and zines in the collection. © 2019 Louise Levergneux. Exhibition “Step and Repeat: Pattern in Artists' Publications” at the Alfred R Goldstein Library. During my visit I was experience the Special Collections' most recent exhibition "Step and Repeat: Pattern in Artists' Publications." The exhibit in the reading room excavates the pleasures of pattern in the coverings, interiors, linings, and details of thirty artists’ publications. Visually arranged into conceptual motifs (flora & fauna, power, psychedelic, geometric, experimental, liquid, figures, and security), these books aim to mesmerize, distract, propel, disrupt, and entice the reader. © 2019 Louise Levergneux. Books in the show, middle: Clifton Meador, Kor 2007; middle back: Ral Veroni, Gabo Ferro, Flopa Lestani, Nada para el Destino = Nothing for Destiny 2009. © 2019 Louise Levergneux. left: Barbara Hodgson Mrs Delany Meets Herr Haeckl Radiolaria, Retracoralla, Pediastra, Ciliata, etc., Rendered in Paper Mosaicks, 2015; right: Sheryl Oppenheim, Sample Book 2017. © 2019 Louise Levergneux. Nick Butcher and Nadine Nakanishi Graphic Arts Future Corporeal Knowledge 2017. © 2019 Louise Levergneux. left: Chris Fitzpatrick and Karel Martens, Motion 2017; middle: Julie Peters and Karel Martens, Full Color 2013; right: Marianne Dages and Leah Mackin, Ultrices 2016. It’s always nice to personally meet contacts/librarians of special collections and introduce my artists’ books particularly when an genuine interest is shown. © 2019 Louise Levergneux. Ringling College of Art and Design building. University libraries and artists where part of my research for my séjour in Florida. Therefore, I was prepared to visit local studios and collections. I arranged a meeting at Graphicstudio, which is an essential part of the University of South Florida Institute for Research in Art in Tampa. Graphicstudio, founded in 1968, is a university-based workshop engaged in a unique experiment in art and education. Its philosophy to provide artists with the freedom to experiment and pursue new directions to advance their practice, is matched with an exceptionally talented faculty and staff. This combination has attracted world-renowned contemporary artists to the University of South Florida. © 2019 Louise Levergneux. Graphicstudio printing room. Since its beginning, the studio has invited over 100 emerging and established contemporary artists from around the world that have worked in a range of styles and media to produce more than 1,000 limited edition print and sculpture multiples. © 2019 Louise Levergneux. Graphicstudio’s wall of paint. © 2019 Louise Levergneux. Graphicstudio’s archival ink printers. One of the first workshops at Graphicstudio was with Robert Rauschenberg. The artist, along with a dedicated group of faculty, staff and students, avidly experimented with forms and techniques — photo transfer, cyanotype, sepia prints, printing on cloth and ceramics, sculptures with new materials, a hundred-foot-long photograph — and ultimately completed over sixty editions. The studio’s reputation as a place where faculty and staff will eagerly pursue and collaborate with the artist’s every idea and inspiration was established in those early days. This innovative environment continues to be a major factor in its continuing success. © 2019 Louise Levergneux. Tim Baker preparing prints for colour run. © 2019 Louise Levergneux. Carlos Garaicoa, Terrasse St. Denis, 2011, 2-run photogravure with hand-cut folded elements, 17-3/8 x 14.25 x 5-3/16”. Graphicstudio practices traditional printmaking techniques including intaglio, lithography, silkscreen, and relief along with photogravure, cyanotype and pigment prints. Sculpture multiples are produced in a range of media which include bronze, steel, aluminum, wood, rubber, and less traditional materials including lava (basalt) and pigmented resins. Walking into Graphicstudio, I was greeted by Kristin Soderqvist, Director of Marketing and Sales. Kristin hosted a tour of the gallery and facility, explained Graphicstudio’s mission, and shared her knowledge about all the work that enrich the walls by artists who created works. © 2019 Louise Levergneux. Kristin Soderqvist showing me around the studios. The first prints I noticed were of Sandra Cinto, known for her large-scale, dramatic scenarios incorporating water, the night sky and billowing seas. © 2019 Louise Levergneux. top left: Sandra Cinto, Open Sea, 2016, Cyanotype, 22 x 30”; left middle: Esterio Segura, Homemade Submarine SJXXII, 2017, Cyanotype, 32.125 x 46”; left bottom: Sandra Cinto, Untitled, 2016, sculpture: Alabaster, 13.5 x 36 x 12”, base: 30 x 40 x 21”, Walnut Hardwood; right: Sandra Cinto, Chance and Necessity, 2016, suite of 5 two-run, two-color direct gravures with photogravure, 49.75 x 34” ea. As one walks through a hallway, Mark Dion’s Herbarium, initiated in 2007, is noticeable. Herbarium is a suite of etchings printed in two runs. To provide the paper, an aged look, an acrylic wash was hand painted on each sheet of paper, then run with a spit-bite aquatint similar to the wash.
© 2019 Louise Levergneux. right: Mark Dion, World in a Box, 2015, suite of 27 prints (lithography, cyanotype, digital, screenprint, etching, letterpress and woodcut) in a custom-made oak wood storage box with etching and letterpress cover image (on lid) and lithograph inventory list (inside lid), 13.125 x 10.187 x 1.625”. right top: Burt Barr, Wave. Wave by Burt Barr was one of the first digital inkjet prints produced at Graphicstudio. You can examine the piece, Wave, that was installed as a continuous image, 38 feet long along the wall at ceiling height. I was intrigued about the process — Barr’s film August provided imagery for his project. Reoriented as a suite of five panels of three images each, Wave considers the perception of nature, pushing the boundary of its presentation through the scale of the project. 46.5 x 46.5”; right top: Richard Anuszkiewicz, Blue Tinted Star, 1991, Five-color lithograph / screen-print assemblage, 36 x 38 x 1.062”; on pedestal (H 33.25” x diam 33”): Esterio Segura, Submarine Homemade, 2018, bronze with applied patina and white oak pedestal, 12.75 x 26 x 29”. © 2019 Louise Levergneux. Fred Tomaselli, Untitled (bloom), 2018, archival pigment print with 11-run screenprint, 58 x 46” being printed. © 2019 Louise Levergneux. Fred Tomaselli, Untitled (bloom), 2018, archival pigment print with 11-run screenprint, 58 x 46” finished print. © 2019 Louise Levergneux. Mernet Larsen, Raft, 2018, 13-color lithograph with collage elements, 33.75 x 34.25”. Once I was shown Allan McCollum’s Lands of Shadow and Substance, I was intrigued. Allan viewed the original Twilight Zone episodes from 1959 to 1964 on his laptop computer, capturing screenshots of scenes that included landscape paintings. Images of those paintings were digitally edited, printed, and custom framed to create the series entitled Lands of Shadow and Substance. Each of the 27 works in the series are archival pigment prints that have been printed proportionally to its original televised incarnation and is in an edition of three. The series was printed using Epson UltraChrome HDR inks on an Epson Stylus Pro 7900 and framed in custom manufactured frames. Each piece is signed on a label on the back of the frame with a reference image and on the back of the print itself. © 2019 Louise Levergneux. Allan McCollum, Lands of Shadow and Substance (No. 1 – 27), 2014, archival pigment prints, various sizes. © 2019 Louise Levergneux. Kristin removes Allan McCollum’s Lands of Shadow and Substance off the wall to show me the signed label on the back of the frame. In the back hallway you are confronted with a wall covered in psychedelic, black-light reactive wallpaper. This screen printed wallpaper with fluorescent inks was a 2008 project with artist Trenton Doyle Hancock and is called Flower Bed II: A Prelude to Damnation. © 2019 Louise Levergneux. Frame above table: Trenton Doyle Hancock, Wow That's Mean, 2008, suite of four etchings on black paper with chine colle, each: 10.5 x 14”. Imagine what I was impressed with the most — Ed Ruscha artists’ books of course. Since Kristin new I was an artists’ book maker, she made sure, I viewed two of Ruscha’s artists’ books ME and THE and OH NO. © 2019 Louise Levergneux. On wall in background: Philip Pearlstein, Jerusalem, Kidron Valley, 1989, heliorelief with roulette on wood, 40 x 119”. Kristin opening the boxes that contain Ed Ruscha’s artists’ books Me and The, and OH NO. © 2019 Louise Levergneux. Ed Ruscha, 2006, OH NO, colophon page. © 2019 Louise Levergneux. Ed Ruscha’s OH NO, inside pages. © 2019 Louise Levergneux. Kristin demonstrates Ed Ruscha’s artists’ book ME and THE. © 2019 Louise Levergneux. Kristin demonstrates Ed Ruscha’s artists’ book ME and THE, when the gilt edge of the fore-edge is fanned the another way. Well, I was here in Tampa 30 years ago when Graphicstudio was around the corner from the university art museum. It was a small operation and when I came back I had no idea what to expect. When I saw what was there, I was kind of stunned to see how fine everything was. You had this gallery and not only just the gallery and the space and the presses and the different rooms and the staff and all that, but actually had many work to back this whole thing up. I was just completely impressed and touched by everything I saw. It’s quite a facility. Thirty years later in 2000-01 Ruscha returned to the atelier, this time for a suite of color photogravures and a limited-edition artist book. The early and late bodies of work share striking similarities in the interplay of word and image and in the exploration of the intersection of fine art and commercial printing techniques, and display an enduring commitment to the artist book form by Ruscha, a pioneer of the artist book movement in the 1960s. ME and THE (2002 cloth covered book with one-color fore-edge printing and gold leaf edges, closed book: 5-1/4 H x 7-1/2 W x 2-1/8 D inches, an edition of 230) and OH NO are fore-edge books, with printing that appears when the gilt edge is fanned one way or another. The pages of the book are blank, perhaps a commentary on the meanings we would ascribe, or fail to ascribe, to such seemingly simple words. 9 x 16-3/8 x 3”. It was an amazing afternoon of exploring the various rooms for lithography, silkscreen... And witnessing all the excellent work that Graphicstudio and artists have accomplished together. If you are in Tampa make an appointment to visit this facility. A visit to Graphicstudio was an incredible sensory experience! Happy Holidays to all my loyal readers! Since the kickoff of the Half Measure Studio blog posts in December 2015, I have typically shared the Ottawa, Canada, Christmas lights. This year, I decided to produce a short video joyfully celebrating the holidays. Don’t forget to march to the beat of your own Little Drummer Boy! To those of you who are continued readers of the Incessant Journey posts, sorry for the duplication, but do accept my good wishes. Soon we say goodbye to 2018, a very active and busy year full of inspiration! But as the horizon of 2019 draws nearer, I find myself looking back at my continuous travels and visits of artists and collections over the recent year. I’m appreciative to all who were generous in sharing their work through my blog post in 2018. It has been a time full of creative inspiration and wonder. Everyone has helped me to aspire to create more artists’ books and to continue writing my posts. I have been thrilled to meet and talk with all of you. Let the magic of Christmas bring you peace and prosperity for 2019! © 2018 Louise Levergneux. A butterfly! Next, on my tour of artists in Austin was handmade paper maker Yamandu Ploskonka. Yama makes paper under the distinct imprint Papel Texano. He is everything related to paper, but, in addition, a trainer, a fixer, a communicator, an inventor, and an innovator. He loves materials, arts, crafts, creative ideas, design, electronics, mechanics, people, prototypes, and tools. In late 2017, Yama made a breakthrough regarding an ideal charcoal, pastel paper surface and achieved the Cinque Tooth Paper, Papel Texano’s specialty “finish.” A new/old paper; new because it’s being presently produced and old since it is a reinvention of the textured renaissance papers that the masters drew upon. © 2018 Louise Levergneux. Yama demonstrating the pulp used for his handmade paper. © 2018 Louise Levergneux. Yama demonstrating home made pulp beater used for his handmade paper. These deep grooves of Cinquecento paper are ideal for charcoal, chalk and sanguine artists. Typically made by hand with 21st century methods in Austin, this very classic surface on handmade paper is again available to artists and everyone! Why so much tooth in Renaissance papers? Would you like to appreciate the history of paper? 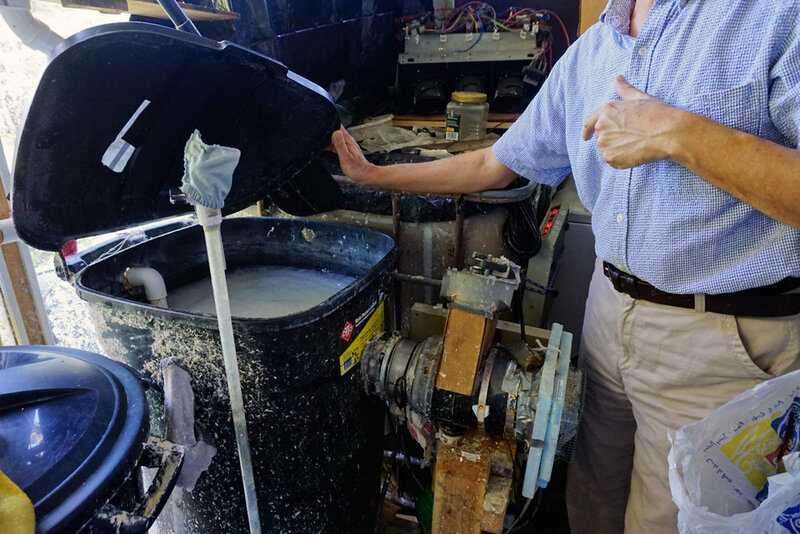 How to make paper pulp with a garbage disposal? Have you ever asked yourself any of these specific questions, the answers are here at Papel Texano. Visiting with Yama was a valuable experience! I had a delightful afternoon and evening. We talked candidly about paper and more paper. Yama’s humour is to savour as he endeavours to share his knowledge. We were shown around his outside studio with lots of homemade equipment which was fascinating. I naturally enjoyed the elaborate description and the key reasons behind his first artists' book entitled Touch This Art! The Book as Yama explained the intricate details. © 2018 Louise Levergneux. Yama’s CNC router at work. © 2018 Louise Levergneux. The finished styrofoam mold. © 2018 Louise Levergneux. The result from the mold to create Touch this Art! © 2018 Louise Levergneux. Another cast paper print using the CNC router. Gorgeous to the touch! © 2018 Louise Levergneux. 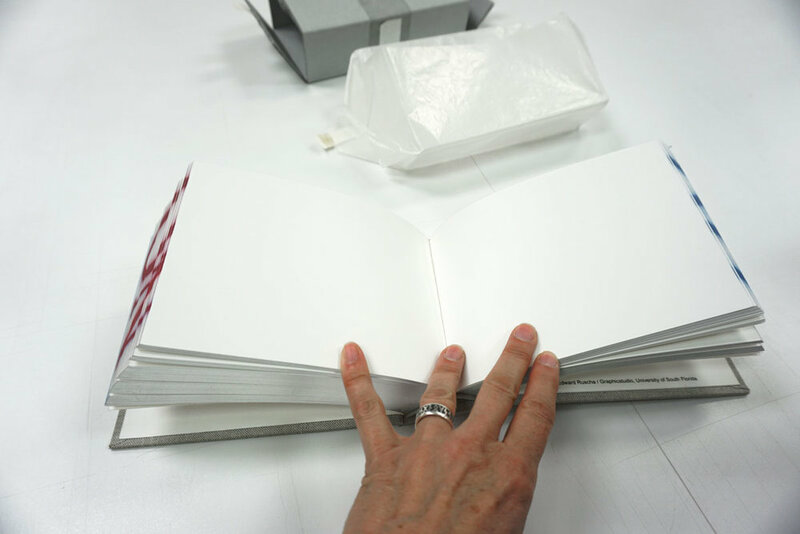 The bookbinding design of Touch This Art! The Book is an accordion structure that reminds us of Aztec and Mayan codices. The 100% cotton, handmade cast paper pages in light pink/red hue is from iron oxide. The pages are mounted on a lengthy piece of amate (a type of bark paper) paper. Yama also explained the machine that made Touch This Art! The Book, a CNC router — Computer Numerical Control machine — a computer-operated carving tool. © 2018 Louise Levergneux. Yama joking as he prepares a lovely meal for us. After much conversation about his studio, paper, and art, Yama made my husband and I a great pasta meal before we left. Yama was amazingly generous with his information and practice. Yama even took the time to gave me the excitement of making handmade paper, elbow deep in pulp. Before leaving, I purchased several sheets of paper to reproduce an image on my Epson Archival Ink Jet printer. I may have found a papermaker for the end sheets of my upcoming book on Live Oak (Quercus Virginiana). © 2018 Louise Levergneux. My first try at stirring pulp with Yama’s help. © 2018 Louise Levergneux. Yama showing me how to drip the water from the mold. © 2018 Louise Levergneux. Seeing the results. © 2018 Louise Levergneux. Yama’s vat with signatures of visiting artists to his studio. Recognize some of them? © 2018 Louise Levergneux. Yama laughing! © 2018 Louise Levergneux. Adding my signature to the famous vat. If you ever find yourself in Austin, a stop at Papel Texano is a must! Five years ago on my way back home, I visited Minneapolis, Minnesota. At the time Jeff Rathermel was Executive Director of the Minnesota Center for Book Arts in Minneapolis. I took the time to drop by and view the exhibition Directed: The Intersection of Book, Film and Visual Narrative exhibition. I was pleased to participate with my artists’ book Decades Apart in this juried exhibition. Jeff was kind in showing me around the show and the MCBA. With no knowledge at the time that Kate Burke — a Minneapolis artist who has a recognized career in both public art and painting — was chosen to design manhole covers for the Nicollet Mall in the city. The Nicollet Mall underwent a redesign by James Corner, designer of the High Line in NYC in 2017. The original manhole covers installed in 1992 were removed, cleaned and reinstalled. Nicollet Mall is comprised of 75 covers with eleven unique designs each cast seven times. The new concrete walkway has an etched leaf, branch and a basket weave design. This is the new home of the manhole covers. To my surprise, while researching streets on Google Map for City Shields, an on-going project, I noticed a wonderful manhole cover. What dismay! I had overlooked the opportunity to photograph some of the most uniquely designed covers for my series. I was devastated! Researching till I discovered the name of the artist and communicated with Kate Burke and later featured her work on one of my blog posts. It’s been a year ago almost to the day. I visited Minneapolis at the end of September 2018 and walked Nicollet Mall to find most of the manhole covers designed by Kate. I was thrilled! I photographed in late afternoon while walking in the drizzle most of the 13 blocks of Nicollet Mall. © 2018 Louise Levergneux. Haralson Apples, manhole cover on Nicollet Mall, designed by Kate Burke. © 2018 Louise Levergneux. The Loon, manhole cover on Nicollet Mall, designed by Kate Burke. © 2018 Louise Levergneux. Northern Pike, manhole cover on Nicollet Mall, designed by Kate Burke. © 2018 Louise Levergneux. Lady Slippers, manhole cover on Nicollet Mall, designed by Kate Burke. © 2018 Louise Levergneux. Wild Rice, manhole cover on Nicollet Mall, designed by Kate Burke. © 2018 Louise Levergneux. Corn, manhole cover on Nicollet Mall, designed by Kate Burke. © 2018 Louise Levergneux. Oats, manhole cover on Nicollet Mall, designed by Kate Burke. © 2018 Louise Levergneux. Norway Pine, manhole cover on Nicollet Mall, designed by Kate Burke. © 2018 Louise Levergneux. The Walleye, manhole cover on Nicollet Mall, designed by Kate Burke. © 2018 Louise Levergneux. Wheat, manhole cover on Nicollet Mall, designed by Kate Burke. © 2018 Louise Levergneux. The Timber Wolf, manhole cover on Nicollet Mall, designed by Kate Burke. ©2018 Michael Sutton. Walking over the famous Walleye on the sidewalks of Nicollet Mall on September 27, 2018. © 2018 Kate Burke. 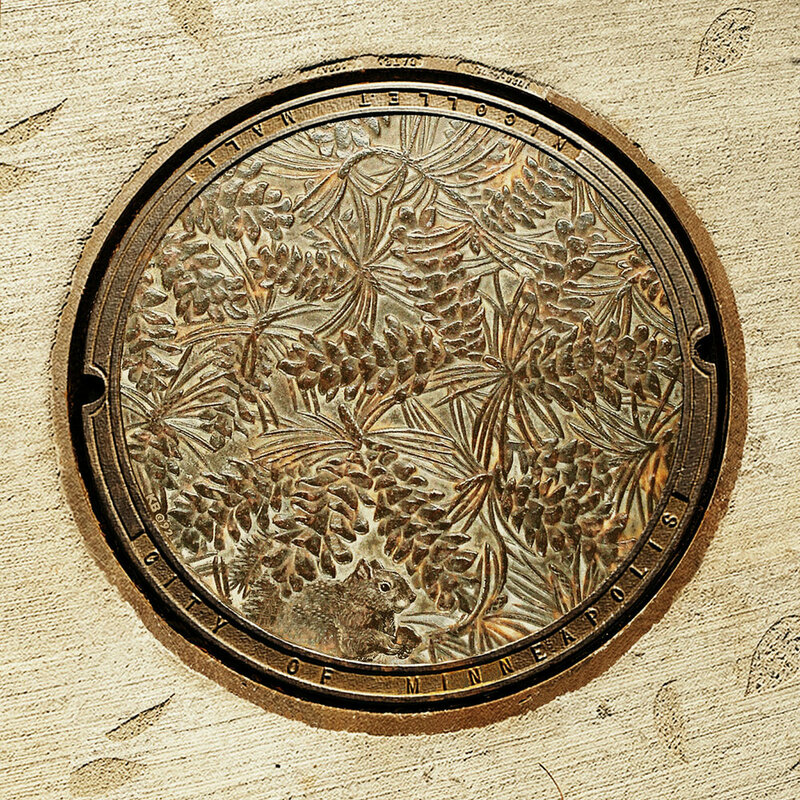 Norway PIne, manhole cover, when it was first installed, designed by Kate Burke. © 2018 Kate Burke. Oats, manhole cover when it was first install, designed by Kate Burke. Have you seen a unique manhole cover lately? If so, where? Another volume? Not sure, I have other projects I would like to accomplish, but one never knows.